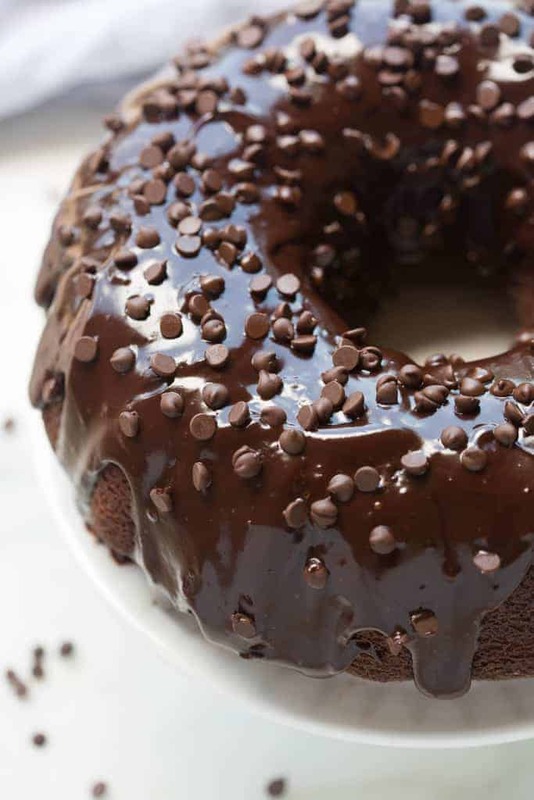 This is an easy and moist chocolate bundt cake recipe. Top your homemade chocolate cake with chocolate chips and smother it in chocolate ganache for a next cake that everyone will love! You know what I really love about bundt cakes? You can make them look really pretty without any special piping or cake decorating materials. I love this red velvet bundt cake with a sprinkling of white sugar crystals to make it look pretty. I’m not going to lie, my go-to recipe for a chocolate bundt cake is usually this doctored-up cake mix version. Last year I made 12 of them into chocolate peppermint bundt cakes (using the cake-mix version) for a huge Christmas party. They freeze beautifully, so I made them all two weeks in advance. They were a huge hit at the party, and completely low-stress for me. As much as I love the cake-mix version, I’ve been determined to make a fantastic, homemade chocolate bundt cake, and this one is just that! I added some mini chocolate chips to the batter to make it extra chocolatey and delicious. Start by combining the dry ingredients in a large mixing bowl. Next, in a saucepan, melt the butter and add the oil, cocoa, and water. Bring the mixture to a boil, whisking constantly, then pour it on top of the dry ingredients. Then stir in buttermilk, eggs, and vanilla. Finally, stir in the chocolate chips and pour it in your bundt pan, and cook for 45-55 minutes! It doesn’t get much simpler or easier than this homemade ganache. Make the chocolate ganache by first heating the cream until simmering. Then pour your chocolate chips into the cream and let it sit for about 5 minutes. Whisk it until smooth and drizzle it over your chocolate cake! 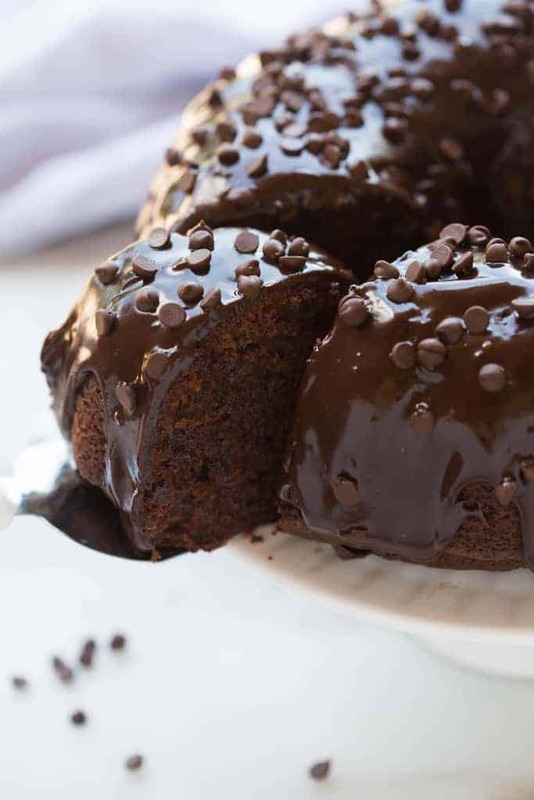 Use a spoon to drizzle it on top of top of the cake and you’ve got yourself a beautiful, simple, irresistible chocolate bundt cake! In a large mixing bowl, whisk together flour, sugar, baking soda, salt and cinnamon, set aside. Add butter to a medium saucepan over medium heat. Once butter has melted, stir in oil, cocoa powder and water and bring mixture just to a boil, whisking constantly. Pour hot butter mixture into flour mixture and stir. Stir in buttermilk, eggs and vanilla and whisk mixture until well combined. Fold in mini chocolate chips, if using. Pour mixture into prepared bundt pan and bake 45-55 minutes or until toothpick inserted in center comes out with a few moist crumbs. Cool cake in the pan for 5 minutes, then invert onto a wire cooling rack to cool completely. Once cake has cooled, make ganache. Place cream in a large microwave safe bowl and heat for about 2 minutes, or until the cream is simmering. Carefully pour chocolate morsels into cream and allow mixture to sit for 5 minutes. Whisk the chocolate and cream until shiny and smooth, about 1 minute. Use a large spoon to drizzle the ganache over the cooled cake. Sprinkle with remaining mini chocolate chips, if desired. 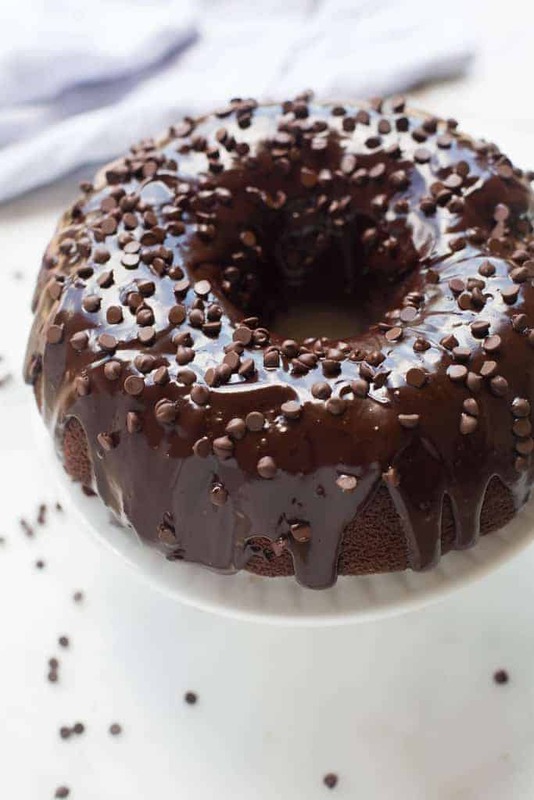 We love your chocolate bundt cake….have just discovered it and am now making a second one….Thank you for sharing the recipe and tips! Just made this. Left out the cinnamon, added about a cup of chocolate chips to the batter. And cut the ganache amount in half, perfect amount, The cake came out nice and moist. I have just discovered you and i make all my food from scratch so i am excited to make my first chocolate Bundt cake. What a great idea! I’m so happy you found me–Hope everyone loves the cake! Absolutely delicious! Thank you for the amazing recipe! I made this cake and turned out great! I did cut the sugar in half though and used coconut palm sugar. Burnt the first effort but you were on my shoulder and said do it again!! Second one was just delicious and Another one coming up next week!Thanks for getting me going again! I dtarted seriously lesrning to bake about a year and a half ago. This recipe was the first chocolate cake I tried. I think of it as the perfect chocolate cake. Flavorful, chocolity, moist and it looks really beaitiful. 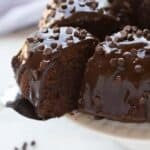 It’s still my favorite chocolate cake recipe and the one I go to when I need to make a cake but don’t want to try a new recipe. I have a no egg chocolate cake recipe. can I make it in a bundt pan rather than a 9×13? That should be fine (but saying that without knowing your recipe at all). Most bundt cakes cook about the same time, 45-55 minutes. A really nice cake but I would call it a cinnamon cake with a with a hint of chocolate, rather than the other way round. Without the ganache, there’s not a huge chocolate flavour. This could be because I tend to add extra chocolate to lots of recipes and I didn’t here so that might be just what I’m used to. Really nice spice though and my coworkers loved it! Intense chocolate flavor. I at first thought the cake was too dense, but realized that it was probably because I used coconut oil instead of vegetable oil, and it is a solid at room temperature. The next day, the rich flavor was so good that I didn’t care whether it was dense or not! I will try it again with vegetable oil, but this cake is definitely a keeper.